A group of students then set out for downtown. The footsteps of students could be heard along the busy roads of Redwood City. As workers took a look at the students, a few thumbs up were given. A sign reading “Honk for better gun control” was held tall against the wind. As people in cars read the signs, the honking sounds of agreement rang out and student cheers followed suit. 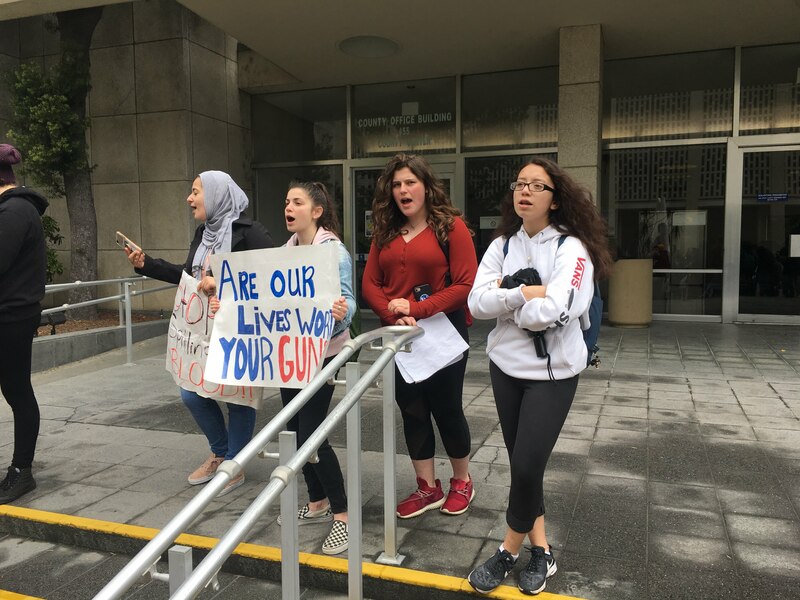 After marching into downtown Redwood City, Everest students were met by students from other schools: Sequoia High School, Woodside High School, Summit Preparatory Charter High School and Menlo-Atherton High School. The quintet of schools gathered in the open cement square in front of the San Mateo County History Museum. Among the crowd, leaders from each school stood tall and yelled out cheers. The group then moved to City Hall to meet with Redwood City Vice Mayor Diane Howard. Ms. Howard gave a speech to the students, expressing support for their commitment to peaceful protest and encouraging them to seek respectful dialogue. Once the speech was over, the students headed to the courthouse. At the courthouse, many speeches were made; yells mixed with chants were made to grab pedestrians’ attention. After about an hour more of protest, students dispersed to get lunch and head home. The March 14 walkout was approved and was able to go forward with the support of the faculty. Everest junior Isabella Gutierrez decided to join the walkout. “I feel that our school has not discussed the issue of school shootings enough, and I feel that with our current administration and the political status of the U.S. this is a very important topic to talk about, considering the difference between Republicans and Democrats and the possibility of our president arming teachers. I also feel that it’s important to find the solution since 7,000 kids have died due to gun violence,” she said. There was a lot of confusion about the communications that were sent to parents and students regarding how Everest was going to approach the walkout. Several emails were sent, the first of which (a note in the school newsletter, excerpted below) stated that parents only had to call the front desk to give permission to their child to participate in the walkout. The next day, another email was sent, saying that a parent or guardian had to be physically present to sign their child out. The evening of the walkout, Everest administration sent one more email, reiterating their commitment to student expression. This group of four to five counter protesters went to speak to the vice mayor about their views on gun control, arriving and leaving before the main group of protesters got to City Hall. “Our goal: maybe just to have our voice heard by the vice mayor, which we did have, and, yeah, that was probably our goal, just to have our voice heard,” Press said. Students from Summit Public School: Tahoma in San Jose also rallied against gun violence, joining with students from their sister campus, Oak Grove High School, to honor the 17 victims of the Parkland shooting. Students from Summit Public School: Denali also participated in a rally. The images below are courtesy of Expeditions teacher Aaron Calvert.